Some more new ship news! Last Wednesday, the Carnival Horizon debuted in the US. She sailed into the Big Apple early Wednesday morning, and the party didn't stop until she was off to Bermuda! 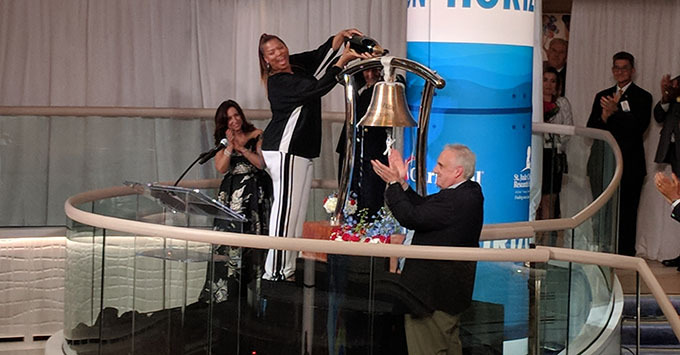 Queen Latifah, Godmother of Horizon, poured a massive bottle of champagne over a bell, officially christening the newest ship. The christening was followed by a Lip Sync Battle competition where CEO Arnold Donald and President Christina Duffy took the stage to warm up the crowd, lip syncing and dancing to "I Gotta Feeling" from the Black Eyed Peas and "Uptown Funk" by Bruno Mars. The main event was a battle between Latifah and Jake Elliott, kicker for the Philadelphia Eagles. Elliott, complete with a huge blonde wig, performed Whitesnake's anthem "Here I Go Again." Latifah was the big winner with her rendition of "It's Raining Men" by The Weather Girls. The Carnival Horizon is Carnival's 26th ship, second in the Vista class. Horizon will do a few cruises out of Manhattan, before homeporting in Miami. The Carnival Panorama, the third Vista class ship, is set to debut in late 2019. She will sail from Long Beach, California.